Fake Food Watch: New Nabisco Triscuits: We Made a Real-Food Dent in Industrial Fake Foods! Holy healthy foods!!! They hear us. And they're making product changes to appease and please us! Our Real Food movement is apparently having an impact on at least one industrial fake-food manufacturing mega-corporation. Just imagine! A brand-new Nabisco cracker line obviously created to appeal to shoppers looking for products made with real foods, and not concocted with chemicals, additives, fillers, stabilizers, and dozens of fake-food industrial ingredients. I found this box (see at right) in a special display at Stater Bros, a major 167-store grocery chain. Not at a health food store, not some expensive specialty-foods store. A typical chain grocery store, albeit one that does try a bit harder to also stock better-quality fare (expanded organic produce sections, La Brea Bakery breads, a to-go salad bar). But all Americans indulge in snacks. These particular snacks appear to be largely free of the cheapest, nastiest non-food chemicals and fillers, unlike almost all processed snack foods. That, alone, would be huge health news. That, alone, is a signal that the Real Food movement is starting to impact the U.S. food supply. The ingredients sound appealing, like ingredients you and I might use in our kitchens. 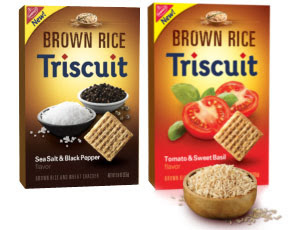 Which, of course, is Nabisco's whole marketing point: to invoke a much-desired "health halo" effect for this new Brown Rice line of Triscuits, thereby achieving their sole goal of increasing sales and profits. "Triscuits... delicious... real food snacks. Made with delicious real food ingredients." "We start with 100% WHOLE GRAIN BROWN RICE & WHEAT and bake in real food ingredients such as pieces of delicious golden SWEET POTATOES or savory RED BEANS." I sheepishly confess... the new cracker tastes terrific, although a tad too salty. I like the lighter texture and crispier crunch better than traditional Triscuits. I'm sure the four other flavors available at Stater Bros also taste terrific. Industrial-made snack foods are always engineered to taste absolutely terrific. Is this the entire ingredient list? I don't know. Are any of the ingredients laced with chemicals, additives, fillers, stabilizers? I don't know. Probably yes, since the box has no spoilage date and does not indicate "no preservatives." As a Real Food advocate, though, I celebrate Nabisco's new Brown Rice product line of Triscuit crackers. This new product that sounds seemingly near-free of industrial ingredients means we are that having an impact on industrial fake-food manufacturing mega-corporations... in this instance, Nabisco, which is owned by Kraft Foods, conveniently renamed recently as Mondelez International. Making one tiny dent in product formulation strategies for industrial fake-food corporations is cause for celebration. Certainly, it's only the very beginning of what will be a long crusade to clean-up the health-shattering morass of U.S. industrial-made foods... but I feel encouraged. They hear us. And they're finally making product changes to appease and please us! These two are quite filling and survival warehouse cooking systems keeps you on go for long time. I'm chomping on the original right now. Nom! 3 ingredients - whole wheat, oil, salt. I like the original ones because they have more fiber. 0.5 grams per cracker and only 3 ingredients (whole grain wheat , soybean oil and sea salt). Only complaint is I assume this is GMO soybean oil…...This is the original triscuit, I speak of. Triscuits, have ALWAYS been whole grain-they just never marketed themselves that way. Although, I would imagine they may have had way more preservatives and junk in them before. Being that I don't have access to an old Triscuit box, I may never know. Your blog is so informative thanks for sharing with us keep going good work like this. I can say this is the perfect blog for everybody who read and post here everyday. I don't know why I always visit here maybe its so nice to read here a interesting topics all day. why would we trust Nabisco brand anyway?! if you want Triscuits, find the alternative version. *woven wheat crackers* that's what they're supposed to be. dress them up as your tastebuds see fit. if it has a commercial. Do. Not. Eat. It. Wheat (chemically modified), soybean oil (genetically modified and esp. harmful to males), sugar (duh), and yeast extract (MSG) do NOT belong in the same conversation as the word "healthy".